Pretty Simple WordPress Theme is a very simple yet powerful responsive WordPress women based theme from Pretty Darn Cute developer club. This theme is specially designed to use for minimal web designer those who’d like to showcase their content and media in short and sweet for the visitors. You will find the all amazing features and possibilities to create any kind of online business, blog, personal, freelancer, graphic designer or websites. 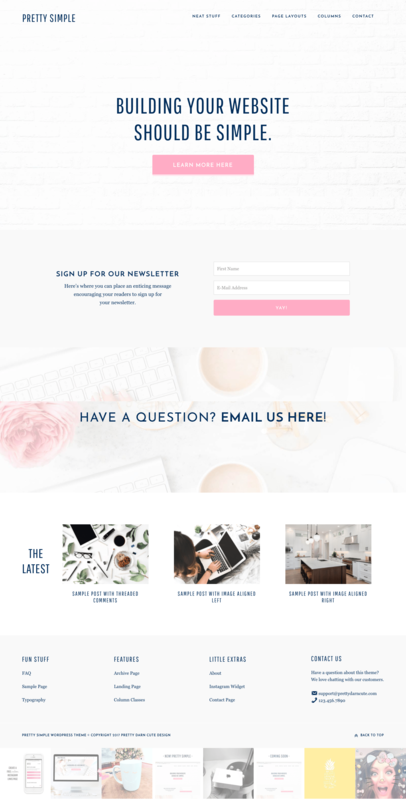 Pretty Simple WordPress Theme comes with a very clean and neat white background with hot pink color filled womanly approach for girls to use on personal blogging, cooking tips, fashion shows, showcase fashion products and etc. Pretty Simple WordPress Theme comes with plenty of custom layouts and pre-defined page templates which can be directly used to create your website. These layouts and templates will save your time & quickly build a responsive website for your any kind of online business websites. Moreover, Pretty Simple WordPress Theme has built with a powerful Genesis framework, which is the parent of this child theme! There are also advanced customizable options; live WordPress customizer options and custom hook setup and many more. Even you can find the genesis plugins which will help you to build an out of box website for your visitors. Clean Landing Page Template to promote your products using WooCommerce plugin! Completely Responsive web design and mobile ready!